The Hubble Space Telescope has photographed a group ofcolliding galaxies that won a cosmic popularity contest voted on by the public. The snapshot features Arp 274 (also known as NGC 5679), agalaxy smashup going on as three distant galaxies merge into one, drawn in bytheir mutual gravitational attraction. On April 1 and 2, Hubble's Wide FieldPlanetary Camera 2 snapped the photogenic site, located about 400 million light-yearsaway. Arp 274 won the Space Telescope Science Institute's "YouDecide" competition, which opened up a poll to determine the target ofthe next space portrait in honor of the "100Hours of Astronomy" project, part of the ongoing InternationalYear of Astronomy. The striking object received 67,021 votes out of thenearly 140,000 votes cast in the contest. Voting ended on March 1. The two biggest galaxies are spirals that appear mostlyintact. The tiny third galaxy shows more signs of disruption. 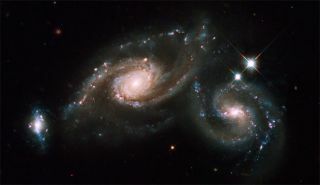 Two of the three galaxies appear to be forming new stars ata high rate, as evidenced by the bright blue knots of star formation that arestrung along the arms of the galaxy on the right and along the small galaxy onthe left. The picture was made with blue, visible, and infrared light filters,combined with a filter that isolates hydrogen emission. The colors in the imagereflect the intrinsic color of the different stellar populations that make upthe galaxies. Yellowish older stars can be seen in the central bulge ofeach galaxy. A bright central cluster of stars pinpoint each nucleus. Youngerblue stars trace the spiral arms, along with pinkish nebulae that areilluminated by new star formation. Interstellar dust is silhouetted against thestarry population. A pair of foreground stars inside our own Milky Way are atthe far right. NASA launched the Hubble Space Telescope in April 1990.Since then, the observatory has spent nearly 19 years scanning the depths ofthe universe and returning stunning views to scientists and the public onEarth. Four NASA space shuttle crews have visited the spacetelescope to make repairs and upgrades during its orbital life. The fifthand last overhaul for Hubble is currently slated to launch on May 12. Thatmission includes five spacewalks aimed at extending Hubble's lifetime throughat least 2013.